Methi Matar Malai is a restaurant style meal made at home. Fenugreek leaves and green peas are cooked together in a creamy vegan gravy to make it palatable. If there is one thing that I enjoy in cooking then it’s got be recreating restaurant style dishes at the comfort of my kitchen! If you are a regular at any Indian restaurant, you would be familiar with most of the curry and gravy recipes here on Cookilicious. They are all adapted from various Indian restaurants I have dined in and loved. Most are my favorites and some KR’s. Today’s special recipe is my favorite and I am sure you will love it too. It’s called Methi Matar Malai. Made with a beautiful and colorful combination of methi or Fenugreek leaves, green peas and cream. It’s not just a visually appetizing dish but an extremely delicious one too. The malai or cream is the soul of the dish as that is what gives it the mildly sweet yet rich flavor. This is one of my absolute favorite dish to order at an Indian restaurant. This and garlic naan is one mouth-watering combo! Order it the next time you visit an Indian restaurant and thank me later! Although I had this for lunch and dinner today, I am already craving for more just writing about it here. Sigh! You can never get enough of Methi Matar Malai! People who have tasted this dish will agree with me wholeheartedly! I just know it! I don’t think Fenugreek or methi is used in the west as extensively as its used in Central (Turkish & Egyptian) & Asian parts of the world. In India, we use this plant in many forms. The leaves of this plant has a slight bitter taste to it if consumed raw. But don’t let that confuse you. It is rich in iron and vitamin K and lends a delicious taste to any dish it’s added to. Fenugreek leaves are more widely used as compared to its seeds primarily due to its immense nutritional benefits. While the seeds of this plant are used for the flavor, the leaves have herb nutritional value in them. These leaves are also dried and used in many Indian preparations. You would remember reading about kasoori methi in many of my Indian recipes. That is nothing but dried Fenugreek leaves. Crushing these dried leaves before adding them to any dish releases the real flavor of it. On the other hand, green peas give this dish a crunch and balances the spicy and bitter flavors with its natural sweetness. Did you know that green peas are not vegetables. They are part of the legume family and are very low in calories. Furthermore, peas contain just about every vitamin and mineral you need, in addition to a significant amount of fiber. When green peas and methi come together, they make one killer combo! The other core ingredient is malai or cream. All these years, I have made this dish vegetarian but not vegan. This time when I decided it dairy free for all you vegans out there. Why should you miss out on this delicious dish just because it has dairy! I have used boiled cashew paste in this recipe to give it a natural malai/creamy texture. 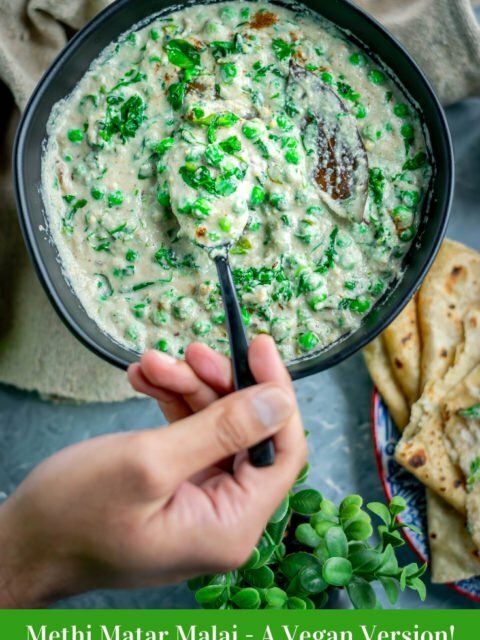 Methi Matar Malai/Fenugreek Green Peas Gravy may just look very complex to make, but trust me, it is one of the simplest gravies I have ever made. In just few steps, you can prepare this gravy easily. We need fresh methi leaves for this recipe. Dried ones will not do justice to this dish. Fresh methi leaves are easily available at any Indian grocery stores. In fact, even frozen fenugreek leaves are available but I suggest you avoid them for this recipe. Fresh leaves are best suited to make Methi Matar Malai. Clean and wash these leaves thoroughly a couple of times as it contains lots of mud and dirt. Remove the leaves from the stems, carefully. This could be a tedious job but it is totally worth the effort. I have a suggestion, ask you spouse to do this for you! 😉 We will then be blanching these leaves in order to make this recipe. to the pan and mix. This is important as it helps binding the gravy together. To this add the cashew puree to the pan. Stir and cook for 1-2 minutes and then add water. Mix using a whisk till the water blends well with the mixture. Then add garam masala, salt and sugar to the mix and give it a stir. Now add the green peas and cook it for a minute or two. Meanwhile, chop the blanched methi leaves and then add it to the pan. Mix it all together with the gravy and continue to cook for another minute or two. Now, if you are not vegan, then at this point you can choose to add some fresh cream to the curry. I didn’t add any cream/malai as I wanted to keep it dairy free and it tasted just great without it! Take it off the flame. Serve Methi Matar Malai with any Indian bread or steamed rice. Even though the methi leaves are meant to have a bitter taste, there is no trace of bitterness in this dish. In fact it is a great combination of many different flavors including sweet, spicy and nutty. Dishes like these can be served for a weekend brunch, family dinners or even packed in lunch boxes if you are in the mood to indulge. This rich and creamy gravy dish will keep you satiated for a long time. Truly one of the gems of Indian food that is not just simple and easy to make but extremely appetizing and delectable to taste. Do give this dish a try! Clean and wash these leaves thoroughly a couple of times as it contains lots of mud and dirt. Remove the leaves from the stems, carefully. We will then be blanching these leaves in order to make this recipe. Bring water to a boil and then add methi leaves to it. Submerge the leaves fully in water and let it boil for 2 minutes. Do not overcook these leaves as it will lose its color. Transfer the leaves to a bowl of cold water immediately. Keep this aside for now. Add cashews along with water in a microwave safe bowl and microwave it for 5 minutes. Drain the water and allow it to cool. Then blitz it in a blender to make a smooth and creamy pure. Also prepare a paste of onions, ginger, garlic and green chillies. This is all the prep work that you need to do. Heat oil in a pan, temper cumin seeds, then add bay leaf and the ground onion paste and cook it for 2-3 minutes or till the raw smell goes away. Then add roasted gram flour/besan/chickpea flour to the pan and mix. This is important as it helps binding the gravy together. To this add the cashew puree to the pan. Stir and cook for 1-2 minutes and then add water. Mix using a whisk till the water blends well with the mixture. Then add garam masala, salt and sugar to the mix and give it a stir. Now add the green peas and cook it for a minute or two. Meanwhile, chop the blanched methi leaves and then add it to the pan. Mix it all together with the gravy and continue to cook for another minute or two. Now, if you are not vegan, then at this point you can choose to add some fresh cream to the curry. I didn't add any cream/malai as I wanted to keep it dairy free and it tasted just great without it! Take it off the flame. Serve Methi Matar Malai with any Indian bread or steamed rice. If this dish has got your full attention, then you will surely enjoy preparing these other Indian gravies equally. You can try Punjabi Chana/Chickpea Masala, Achari Dahi Bhindi | Pickled Okra in Yogurt Gravy, Chilly Paneer in Tomato Capsicum Gravy, Vegan Tofu Tikka Masala, Khoya Mutter | Green Peas Masala, Shahi Parwal/Royal Ivy Gourd Curry, Chickpea & Black Rice Dumplings in Spinach Sauce Gravy and Indian Bharli Vaangi/Stuffed Eggplants. I always love this dish. LOve the creamy texture and the vegetarian option to it. this looks so delicious! I’m loving how vibrant the green peas are! I loved it! So creamy and delicious! I have never had this-but it looks great! Creamy and comforting. I seem to be having a problem getting my spoon through the screen. Are you having the same problem? This looks heavenly!